On June 5, 1956, the King of Rock and Roll, Elvis Presley, introduced what would become his top selling hit, “Hound Dog,” on The Milton Berle Show, an early television favorite. Elvis’s performance included exaggerated gyrations that drove the girls in the audience wild, and enraged parents and prudes across the country. By this time Elvis had a number 1 hit with “Heartbreak Hotel” and was touring, continuing to draw animosity from the conservative media and prompting the Catholic Church (La Crosse, Wisconsin diocese) to contact J. Edgar Hoover of the FBI about Elvis being a threat to American security! When Elvis appeared on The Steve Allen Show for his next television performance of the classic song, he performed it wearing a tuxedo and singing to a Basset Hound (real live one) wearing a top hat. Actually, proving that you cannot go wrong by associating with a hound dog, the song sold 10 million records for Elvis and is ranked #19 by Rolling Stone among the greatest songs of all time. Elvis took this tune to the top of the US Pop, R&B, and Country charts, all at the same time. 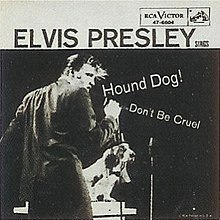 For 11 weeks “Hound Dog” ruled the pop charts, a record that lasted until 1992. How much did the bored looking Basset Hound on the Steve Allen Show have to do with the song’s and Elvis’s success? It is hard to say, but we at History and Headlines believe probably a lot. Hound dogs, like our lovable Hush Puppies, are pack animals and take to people as part of their pack. “Loyal as a hound dog” is a saying with some reason behind it. Basset hounds and Bloodhounds have the keenest noses of all the dogs, Greyhounds are the fastest dog, and Dachshunds are the bravest critter on the face of the earth (just ask one). Beagles are used to detect bombs and illegal substances, keeping us safe, and Snoopy, a Beagle, is probably the most famous dog in history. Various sources name different songs as Elvis Presley’s greatest hit, so do you think it was “Hound Dog” or some other classic? Let us know which ones you think should be considered his greatest hit. Leiber, Jerry and Elvis Presley. Hound Dog. OnlineSheetMusic.com, 2009. Leiber, Jerry and Mike Stoller. Hound Dog: The Leiber & Stoller Autobiography. Simon & Schuster, 2009.